The Skinny: This kidnapping comedy doesn't rate a must-see, but for eighties Hong Kong Cinema it does possess its fair share of enjoyment. Alfred Cheung directed this decently entertaining comedy about nice-guy kidnappers Sammo Hung and Kenny Bee. Hung is Ting, an overweight employee at a jewelry company who's constantly picked on by boss Ms. Chou (Leung Saan). After he's blamed for the theft of a large payoff, he loses his cool and decides to get revenge on his employers. He plots to kidnap Ms. Chou and ransom her for 800,000 HK dollars. 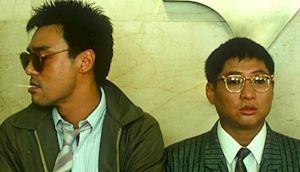 Sadly, his bumbling leads him to accidentally kidnap Jo (Joey Wong), the illegitimate daughter of Mr. Chou. However, before Ting even discovers that he's kidnapped the wrong person, co-worker Biu (Kenny Bee) sweeps in and steals Jo out from under him. Meanwhile, wacky cop Anthony Chan screws around instead of actually solving crimes.